Modern technology has come a long way, and this is certainly true when it comes to roofing. Back in the old days, materials used in roofs simply did not have the same strength, efficiency and durability of today’s roofing. But while we have made some pretty impressive advances in this aspect, a few myths and misconceptions still tend to linger among homeowners. That’s why it’s important to finally address these harmful beliefs and learn the truth behind them. Despite some delays in our small project due to some understandable personal issues, the team at Thompson was very professional and communicative. They were easy to get in touch with, always called back when they said they would, and they did a great job with our repairs. Will definitely use them again in the future for pretty much any construction project they can help with. They'll be our first stop! Thompson Roofing personnel did a excellent job re-roofing my house. I noticed a leak in my roof after a couple days of some heavy rain. So I called several places to get a quote for a roof repair. After speaking with several companies it was a tough call between 3 of them. The representatives from these 3 places were the best of the bunch in my opinion. My reason. For choosing Thompson was how soon they were going to be able to get out and fix my roof. Jonah, the Thompson representative that I worked with was very nice, informative and more than willing to help out however he could. The fix was completed ahead of time and I have had no issues since. Definitely would recommend Thompson roofing to friends and family. 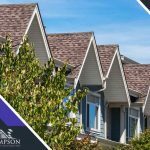 After a severe hail storm came thru wreaking havoc upon our community, Thompson Roofing was there to take care of things and see that the job was done right with not only the roof but with our other damaged property as well. Start to Finish this was a great company to do business with! Scott was very professional and friendly, he did a complete investigation of my roof problems. he explained what the problems were and what had to be done to correct them. He provided me with a complete estimate to perform the repairs. I agreed with the estimate and we scheduled a day to perform them. The repair crew did a very neat professional repair on my roof, we have had two heavy rains since the repairs were completed and there were no leaks GREAT JOB! Sales Rep (Scott Shaw)went over and above to make sure my family was taken care of. Especially nice as we were a small job that many wouldn't even give us an estimate on our emergency repair. Now we are planning on doing the entire roof and will be calling Thompson. Love my new roof! Thompson Roofing and Construction did an awesome job. You couldn't ask for a better company. Thompson roofing was the obvious choice for our family. Customer service was over the top, the care and concern for our home was refreshing, and the multiple options of coverage and design made our difficult decisions much easier. We can't thank Kyle O'Toole, our customer service representative, enough for assisting us every step of the way, and making Thompson Roofing the best experience for us before, during, and after our roofing experience. TR&C did a great job of installing pipe boots. Its been a couple of months and there are no visible leaks inside. Communications is an area for improvement. The level of professionalism was excellent! Really answered all my questions and were quick to get the job done in a timely manner! Just AWESOME! The staff is awesome and does whatever it takes to make the customer happy! Thompson Roofing & Construction did and excellent job of reroofing and vinyl siding our entire home, garage, and shed! Also, they did a great job of replacing screen, hanging new shutters, and exterior painting. It was a very pleasant experience working with Kyle, Keith, and Jeremy. If and when I need work done in the future I will certainly think of them first! Great team of people to be associated with! They did an excellent job replacing my roof after hail damage. They were very professional. I would highly recommend this company. Thompson Roofing did an excellent job replacing my roof after some spring hail damage to my roof. They did a very good cleanup job. The workers arrived on time each dat (two days) and did not leave a mess between the two days.